The one stroke engine was developed in 2001-4, WIPO patented 2003 and presented at Engine Expo 2005 as the compact linked piston or CLP. The CLP 1 stroke achieves six goals most theorists aspire for the ICE. 1 stroke : For every stroke there is power, i.e. fewer movements. 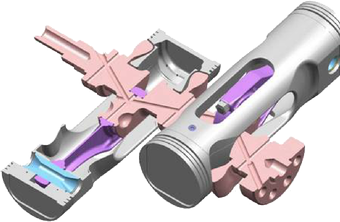 Reduced reciprocation : using Reviflow combustion, there is reduced reciprocation effort as the decelerating piston mass and pin is usefully employed to compress the opposing chamber. Better cooling : The piston is cooled in the sump, not tucked away up the cylinder bore. Conventional : Mechanism uses conventional cylindrical bearings, current philosophy and manufacture technique. The CLP is for many reasons, a mechanism simplification. The best application for the CLP will be as an on the fly generator in an EV Hybrid, where the higher efficiency is valued and where the weaker crankshaft is not exposed to spike loads. Regengen is the brand for the range-extender using a 1 stroke CLP. CLP stands for the ”Compact Linked Piston”. No more compact than inline engines, but extremely compact versus previous linked pistons. It uses linked pistons and is best arranged as an L4 (linked four cylinders). The CLP is one of many ”alternative” engine ideas, however this one uses conventional and known engine philosophies and relationships, only the head piston legs are unrecognisable. The; piston crowns, cylinders, crankshafts, conrods, assembly, ancillaries and valvetrains all remain the same or almost the same. With a linked piston there is much less scraping and lunging and more sliding and slipping because the piston is five times longer, and therefore runs stabilised in its cylinder. Directly connected opposing chambers build helpful relationships, the energy usually wasted to decelerate the piston now compresses the opposing cylinders chamber. Fewer components making fewer movements. Proposed as a recharge engine back in 2005, we (finally) see most manufacturers introducing electric cars needing a range-extender making the one stroke Regengen now more relevant than ever.